We’ve created these 10 Steps to help families in Wales bring up happy, healthy children. They’ve been put together by health experts and parents, and can be used when working with families to help them establish good habits. The information on these pages is to help professionals in their practice as they support families to give children the very best start. Overweight and obesity is a major public health concern. 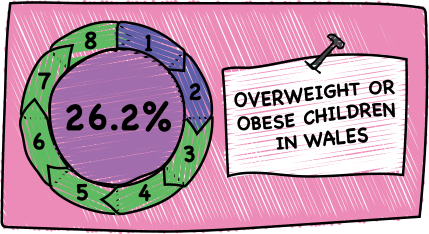 Just over a quarter of children in Wales (26.2%) are overweight or obese (National Child Measurement Programme for Wales 2015/16). Levels are higher across all ages in the more deprived areas. 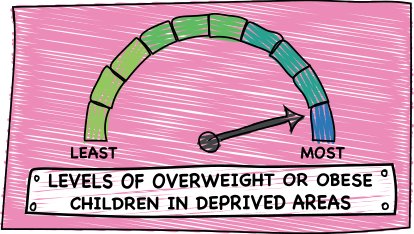 Find out more about childhood obesity in your health board and local authority area here. Public Health Wales Observatory produces a range of information about obesity prevalence for all ages across Wales, which can be found here. Being overweight or obese in childhood has consequences for health in both the short and longer term. Children who are obese can experience health issues such as non-alcoholic fatty liver disease, gall stones, asthma, sleep-disordered breathing and musculoskeletal conditions. There are also emotional and psychological effects of children being overweight, which include teasing and discrimination by peers, low self esteem, anxiety and depression. They may find some sports and other types of physical activity difficult, which can reduce the likelihood of regular participation and a preference for a more sedentary lifestyle. If a child is overweight or obese there is a high likelihood that this will continue through adolescence and into adulthood. This can cause associated health problems such as diabetes, heart disease and cancers – along with a higher risk of premature mortality, disability and morbidity. The 10 Steps are based on evidence from the Cohort Studies, presenting positive things that families can do to help prevent children being obese by the age of five. Insight work was carried out across Wales to inform the development of the 10 Steps. Public Health Wales has carried out the following thematic evidence reviews to explore the steps in more detail. For each topic they present available data on prevalence of the problem, summaries of current guidance, a discussion of risk and protective factors as well as effective interventions. The Evidence Reviews will be available later in 2017. The following resources are available from Every Child Wales to help you support families with young children. 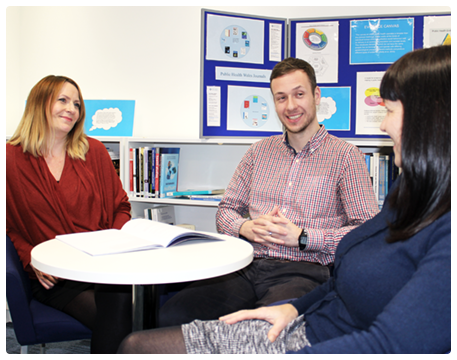 To order hard copies of these resources please contact the Behaviour Change and Public Information Team.